Originally posted on El Enemigo Común. Esta nota también está disponible en español. On January 11, five young people returning home from a weekend birthday gathering were detained by police in Tierra Blanca, Veracruz, Mexico, where they had stopped to get something to eat. Susana Tapia Garibo, 16; José Benítez de la O, 24; Mario Orozco Sánchez, 27; José Alfredo González Díaz, 25; and Bernardo Benítez Arróniz, 25, can be seen on surveillance footage being taken into custody by members of the Veracruz State Police. Following their detention, nothing more was heard of them until Monday, February 8, when the burned remains of two of them, José Alfredo González Díaz and Bernardo Benítez Arróniz, were found on a ranch in Tlalixcoyan, 40 miles from Tierra Blanca. Prior to finding the bodies, several members of the State Police were arrested, including Marcos Conde Hernández, the district chief for the area including Tierra Blanca. According to the government version, the police handed the youth over to the Cartel Jalisco Nueva Generación, some of whose members have also been detained. The disappearance in Veracruz immediately calls to mind the case of Ayotzinapa, when on September 26, 2014, police in Iguala, Guerrero attacked a group of students, disappearing 43 of them and leaving six people dead. The Ayotzinapa 43 remain missing to this day, though the government insists that police handed the students over to the Guerreros Unidos cartel, who then killed them and burned their bodies. The government’s version of events regarding Ayotzinapa was widely dismissed, including by the Inter-American Commission on Human Rights, which deemed the explanation as “scientifically impossible.” Under the banner of #FueElEstado (It was the State), a militant protest movement emerged in Mexico and around the world calling for the return of the disappeared students and placing blame for the killings and kidnappings directly on the shoulders of the Mexican state. Tierra Blanca and Ayotzinapa are but two examples of a much larger crisis in Mexico: that of the impunity and terrorism of a neoliberal narcostate. The Mexico Global Impunity Index, a report released this month by the Universidad de Las Américas, found that impunity levels in Mexico have reached 99 percent. Leaving aside the broader discussion of the desirability of laws, courts, police and prisons to be the mechanism of social control, this means that less than one percent of crimes in Mexico result in someone being punished. Such a statistic would seem to indicate the abject failure of the Mexican government to carry out one of its primary tasks of governability, that of ensuring the safety and security of its citizens. Yet to view it as a failure presumes that the state has any interest in the well-being of its citizenry. Rather, the land, territory, culture, knowledge and people of Mexico are viewed by the elite as resources to plunder, to extract the maximum amount of profit from, and then to discard. Should their neoliberal project encounter resistance, then terror, repression, murders and disappearances become the rule of law, as the law is impunity. The headlines generated by Ayotzinapa and Tierra Blanca serve as useful reminders to the Mexican populace of who is in charge, of the precariousness, fragility and ultimate valuelessness with which their lives are regarded. The seeds of terror are sown in a myriad of ways by the Mexican state; most don’t make their way into the international news. Perhaps no politician has used this atmosphere to their advantage more than Javier Duarte de Ochoa, the governor of Veracruz and ally of Mexican President Enrique Peña Nieto. On the ranch in Tlalixcoyan, where the bodies of the two youth disappeared in Tierra Blanca were found, investigators identified at least 300-400 other human remains. Marcos Conde, the detained police chief, is suspected in the disappearance of at least 18 other people, in addition to the five from Tierra Blanca. In September 2011, 35 people were found tortured and murdered outside a meeting being held by Duarte. At least thirteen journalists in Veracruz have been killed, and four more disappeared, during Duarte’s reign. Duarte critic Rubén Espinosa fled to the seeming safety of Mexico City, only to be executed on July 31, 2015, along with Nadia Vera, Yesenia Quiroz, Mile Virginia Martín, and Alejandra Negrete. In an interview before her murder, Vera, an activist from Veracruz, stated that if anything should happen to her, it would be Duarte who was responsible. The incident leading to Espinosa’s decision to flee was the harassment he received following his coverage of the brutal beating and maiming of eight students from the University of Veracruz on June 5, 2015, by masked men that the students insist were sent by Duarte. On Tuesday, February 9, the day the human rights group Article 19 released a report documenting the disappearance of 23 journalists in Mexico since 2003, a body presumed to belong to disappeared Veracruzan journalist Anabel Flores was found in the neighboring state of Puebla. 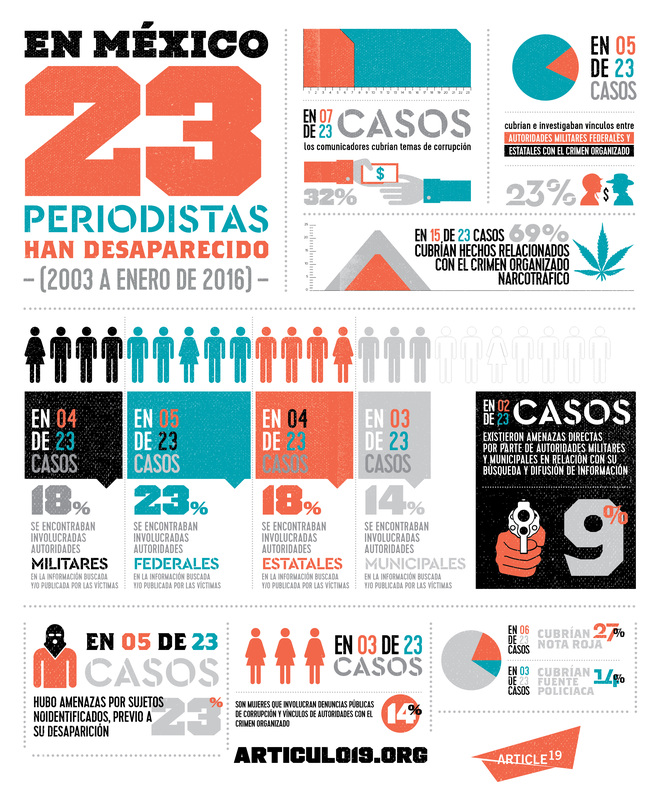 According to Article 19’s report, local, state or federal authorities were involved in the disappearance of 16 of the 23 journalists. With more than 164,000 killed and 27,000 disappeared since the latest manifestation of Mexico’s “drug war” in 2006, and a rampant phenomenon of femicides, with seven women being killed per day, it is easy to say events are spiraling out of control in Mexico. Yet the very same Mexican state has shown itself capable in applying itself when it wants to. For example, under pressure from the U.S., Mexico launched the Southern Border Plan in 2015. Targeting migrants and refugees from Central America, Mexico doubled the number of people it deported during the same period in 2014 and for the first time exceeded the U.S. in the number of Central Americans deported. The Mexican state also excels at enforcing its interpretation of the law when it comes to imprisoning members of social movements. According to CENCOS, 2015 saw the release of 16 political prisoners, while in the state of Puebla alone there are at least 225 individuals either imprisoned or with arrest warrants issued against them for their political work. 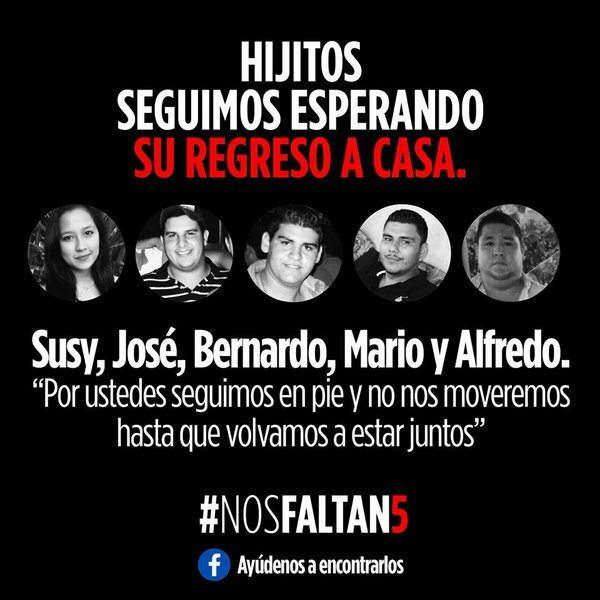 This entry was posted in Mexico and tagged #nosfaltan5, ayotzinapa, duarte, mexico, state, terror, terrorism, veracruz. Bookmark the permalink.